If you made your booking before April 24th 2015 please email info@surfholidays.com for your details. Your email address already exists in our system. Try logging in with your social accounts or send a password reset request. Explore our Ireland surf holiday destinations. Click on the different surf towns to view and book Accommodation & Surf Lessons/Guide in each place. Joe Roddy tells the story of how in 1949 as a young teenager he made a 4 metre board out of wood from a tea chest and surfed in Dundalk, along the East coast. He didn't stick with it and the board was put away never to be seen again! It wasn't really until the early 60s that surfing in Ireland surfaced again. One of the first ever surfers in Ireland was a customs officer from the UK named Ian Hill. Ian first rode a bodyboard at Spanish Point, on the West coast, in 1961. He bought his own surfboard for £20 a few years later and began surfing the coastline in jeans and a t-shirt! There was no wax available back then so he spent his first surf sessions slipping and sliding off into the freezing cold water. In 1963, Kevin Cavey came across images of people surfing in Hawaii in the Readers Digest. The pictures showed waves that were similar to ones Kevin had seen in Ireland, so he went about making a board and putting it to the test. He set up Ireland's first surf club in the East coast town of Bray and put notices in the newspaper to see if anyone else was surfing in Ireland. He got responses from Tramore, Strandhill, Rossnowlagh and Portrush. Around about this time Kevin met the Britton crew...Brian, Conor, Barry & William who lived in Rossnowlagh, County Donegal. They had been introduced to surfing after their parents came back from the US and told them all about it. Rossnowlagh beach was a perfect place to learn how to surf and in 1968 they held the first inter county surf championships there, where county Down beat County Wicklow in the final. By 1970 five local surf groups had evolved: Tramore (T-Bay), the West Coast (Lahinch), Rossnowlagh, Portrush, and Cork. The same year they combined to establish the Irish Surfing Association. Ireland soon became recognised as a surfing country and in 1972 the European Surfing Championships where held in Lahinch in County Clare. The sport began to slowly grown throughout the next two decades. In 1985 the European Surfing Championships returned, in 1988 Rossnowlagh Surf Club established the first surf club house in Ireland and in 1989 the Lahinch Surf shop became the first surf shop in Ireland to open. In the late 90's local surfers began to open up surf schools and surf shops in the main surf towns in Ireland. The popularity of surfing in Ireland grew in thanks to the development of light wetsuits that keep you warm no matter how cold it is. More and more people began taking to the water and Ireland started to produce some really good surf talent. In the mid 2000's surfers like John McCarthy, Richie Fitzgerald & Al Mennie began pushing the limits and surfed the newly discovered big waves such as Aill Na Searrach (Aileens) under the Cliffs of Moher and Mullaghmore (Mully)in Sligo. Ireland is now firmly recognised as one of the best surf countries in the world. The summer months are great for beginners, while the winter is a cold water surf paradise for advanced surfers. Many of the world's best surfers visit in the winter and travel up and down the West & North West coastlines to surf some of the worlds biggest and coldest waves. People come for the surf but especially enjoy the craic with friends in the local pubs recounting their day surfing in the wild Atlantic Ocean. What's the surf like in Ireland? Ireland is without doubt one of the best locations for a surfing holiday. The coastline is a wave rich paradise, offering an extraordinary mix of beginner beaches, reefs, point breaks as well as world class 60 foot monsters! Summer is a fantastic time for a learn to surf holiday in Ireland, the days stay bright until 10pm and the cold isn't an issue (it is still cold but not freezing!!!). Come winter time the seas get stormier and Ireland becomes one of the best surf destinations in the World. Surfing holidays in Ireland are all about sitting out in the water surrounded by mountains, green hill tops, open cliffs and great waves. Donegal has the most consistently good surf in Ireland. Within a 10km area of the surf town Bundoran you can find some of the best waves in the country. Tullan Strand is definitely one of the best beaches in Ireland, it has a nice wedgey A-Frame that rolls into a running left all the way into the beach. Rossnowlagh, famous as one of the first waves surfed in Ireland, remains one of the best beginners beaches in Europe. 'The Peak’, is in the centre of Bundoran town and arguably the best all round wave in Ireland. A reef break that provides a perfect right and left, a nice canvas for turns whilst also throwing out a nice barrel every now and then. The town of Bundoran is famous for its lively nightlife with nightclubs and pubs all down the main street and a wide selection of Ireland surf camps to stay in. Further north are surf areas such as Dunfanaghy, and many more uncrowded spots waiting to be surfed. Donegal is home to some of the best slabs and reefs in the world but the locations are often secret, so get searching! Located along the northern coastline of Ireland where the most popular spot is Portrush. White rocks is a very consistent beachbreak and East Strand is a fast, hollow beach break that get very good on big swells. Portrush is one of Northern Ireland’s busiest tourist town with beachgoers, students and surfers making it a lively destination. There is a lot of waves to discover along the northern coast. Widely considered the adventure capital of Ireland. Located in the North West of Ireland, the county has an amazing beach break in the seaside town of Strandhill, perfect for advanced to beginner surfers. The town has been regenerated in recent years with the new coastal walkway, selection of cafés and bars and the farmers market. Sligo is also home to famous reefs Easkey Left and Easkey Right, the left tends to be a long, slow wave, perfect for longboarders whilst the right is a faster, more hollow wave and one of Ireland's best. Recently Sligo has become famous in the big wave world with the discovery of Mullaghmore, which can be surfed at over 60 feet. Clare is an amazing county for surfing because it offers everything you could ever want in a surf holiday in Ireland: great selection of waves, buzzing local traditional towns, interesting history and amazing landscape including the Burren & the Cliffs of Moher. Lahinch is Ireland’s best known surf town. The main beach is perfect for beginners and intermediates and right next to it is some of the best reefs in Ireland. From breaks such as 'Cornish' to 'Creagh' you are guaranteed an amazing surf, especially if you like lefts! All of these waves are very close to the village, a lively place with a great atmosphere packed with cafés, restaurants and traditional Irish pubs. Located in the South West of Ireland Kerry is a underrated place when it comes to surfing in Ireland but it has some of the best beach breaks in the country. The Maharees is a 5km stretch of beach located near the town of Castlegregory. Along this 5km beach are multiple waves, the most popular being Dumps and Drainpipe. Drainpipe on a good day is a fast hollow breaking wave, great for intermediate to advanced surfers. Inch Strand in Dingle Bay is also a very popular destination when it comes to surfing, with great waves and a lively atmosphere. Ireland’s biggest county so there is a lot to explore. The surf tends to be predominantly onshore in Cork but at times can produce great surf. 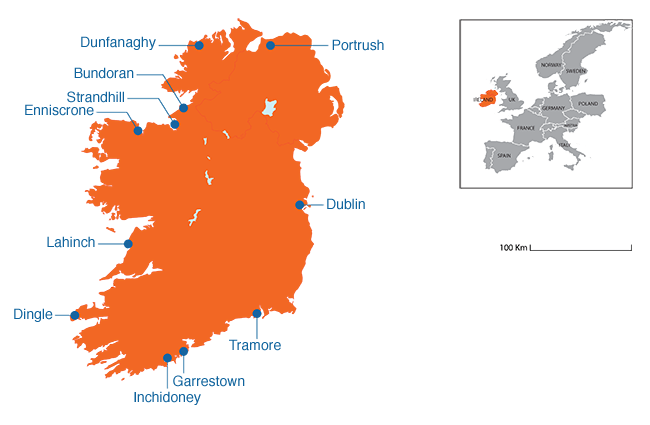 Garretstown, Incheydoney and Castlefreke are the main spots in Cork. Garretstown and Incheydoney offer great waves for beginners and often intermediates. Castlefreke can get dumpy and hollow and best suits confident intermediates and advanced surfers. The main spot in Waterford for surfing would have to be Tramore, a lovely sea-side town, known for being one of the most popular surf holiday destinations in Ireland. Tramore may not have the best surf for Advanced surfers but it is a perfect place to learn how to surf. The promenade offers great restaurants and cafés to have a meal or a coffee after a surf. Not known for its surf but there are some nice waves that can be found for those with patience. Brittas Bay in County Wicklow is a very nice beach for beginners but can also get nice offshore waves with enough swell. In Dublin, areas around Killiney and Donabate pick up swell on occasion but you really have to live close by to get the timing right. For a bit of fun surf the ferry wakes in Dublin Bay! 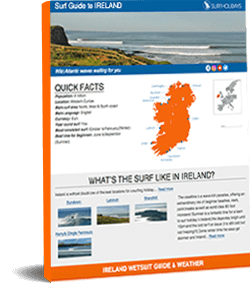 Ireland Wetsuit Guide & Weather? If you are going to be surfing Ireland during the summer (June to August) the best wetsuit is a 3-4mm full suit. If you are surfing Ireland during the Winter/Early Spring months it is a completely different story! So from November to April you will need need a 5-7mm wetsuit with booties, hood and gloves. If you want to enjoy the amazing waves Ireland has to offer you need to be warm out in the water! Weather-wise Ireland is very changeable.During the summer you can have beautiful weather reaching the early 20ºC and yet on other days it can drop to 12ºC and rain. During the winter Ireland has very cold and grey days with temperatures reaching below zero but mostly stays at around 5ºC. Wetsuits will allow you stay in the water for 2 hours but the hard part is getting changed in the car park with the wind and rain on your back. For a more detailed look at when & where to surf in Ireland for your surf level use our Surf Trip Finder. Then browse each destination to discover the best selection & lowest prices. Book your surf holiday online now!